Our White Plains Pest Control Exterminator will identify the source of the pest infestation and create a customized treatment plan to eliminate the pests. 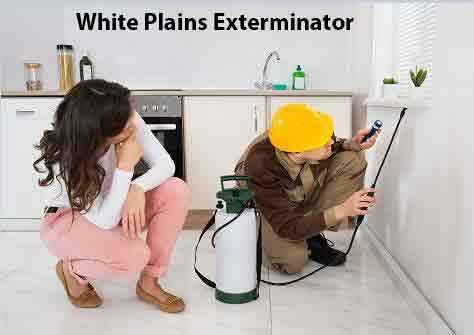 Let us be your White Plains Exterminator that you can Depend On, Give Us A Call Today. 1-844-305-8999. Pigeons can be a real Nuisance in White Plains NY. The uncontrolled pigeon population in Westchester County NY poses a threat to public health, infrastructure and the overall quality of life. Because of the easy access to food, pigeons are spending less time foraging and more time breeding. Bird droppings from Pigeons are very acidic in nature. They eat away at many substrates, especially tar-based roofing materials. Droppings which are left to accumulate on roofs will eventually eat into the material and cause leaks. The life expectancy of a warehouse roof can be cut in half by just a light, but continuous application of bird droppings. If you have Nuisance Pigeons effecting your home or business, Give our White Plains Exterminator a call today. We specialize in Pigeon Trapping and Removal. 1-844-305-8999. Bed Bugs have become a very common problem for residents of White Plains NY. Bed Bugs are excellent Hitchhikers, you can be at a movie and If the person sitting in your seat at an earlier showing brought bed bugs in with them, chances are some will be leaving with you. The common bedbug doesn't grow much longer than 0.2 inches and can be seen by the naked eye to the astute observer. If you notice you have Bed Bugs, applying pesticides yourself for bed bugs is not recommended. If not done properly, it can often complicate the bed bug problem. Give Our White Plains Exterminator a Call Today, we are specially trained in Bed Bug Elimination. There are many types of ants that may be found in your home or business in White Plains NY. Some are actual household pests, while others occasionally invaders looking for food or water. The three most common Ants found in Westchester County NY are the Carpenter Ant, Pavement Ant and the Pharoah Ants. Pharoah Ants are about one-sixteenth inch long. These ants are commonly found in hospitals and nursing homes and have also been known to invade restaurants, apartment buildings and similar dwellings. Pavement Ants are about one-eighth inch long. They generally make their nests in pavement cracks and are also capable of infesting your home or business. If you have ants on your property, home or business Give White Plains Pest Control A Call Today. We will eliminate your Ant Infestation fast and efficiently.